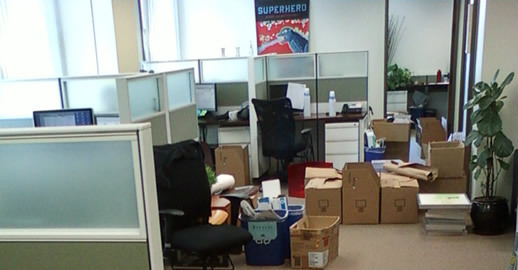 Packing up today, movers come tomorrow while we all get our “V9” on, and then they claim that we’ll be in the new office space on Thursday. Goodbye 625 Broadway, Spreckels Building, Suite 611, Downtown, 92101. Hello 3861 Front St, Mission Hills, 92103! We are luckily getting help from some folks that used to work for the movers in Mergenthaler’s Salt Lake location, they are going to lend a hand to move out our large items from the building. Moving can be pretty stressful without good hands helping. Previous PostMobile Trends -- Going Local! Next PostFriday Humor: Want a Job in New Media? I’m curious tto find out what blog platform you are workingg with?